Brand new 10 Gram Argor Heraeus Multigram Platinum Bullion 999.5 Fine Bar. 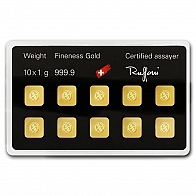 Each bar contains 10 x 1 gram bars of 99.95% pure investment grade platinum bullion. 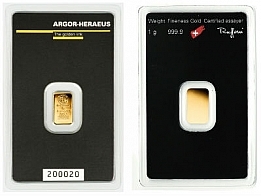 The 10 Gram Argor Heraeus Multigram gold bar features ten individual 1 gram platinum bars. Each bar features the weight, fineness and metal type of the bar, along with the official Argor Heraeus hallmark. The bars are sealed in a certicard, which has the Argor Heraeus logo at the top. The 10 gram Argor Heraeus Multigram platinum bar is produced by Argor Heraeus, one of Switzerland's main precious metals refineries. 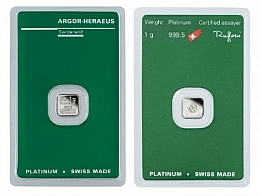 In addition to the 10 gram size, Suisse Gold also sell the Argor Heraeus platinum bar in 1 gram and 1 ounce sizes. 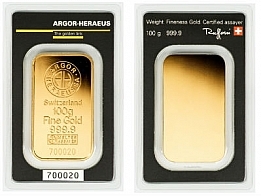 Argor Heraeus multigram bars are available to bullion investors in gold, silver, platinum and palladium. Argor Heraeus precious metals products are available in sizes ranging from 1 gram to 1 kilogram.